1.Die cut and build the die decoupage on your chosen papers, edge the surround of the frame shape with foam tape, making sure there are no gaps, fill with sequins. Make a lid using the frame with a acetate window to keep the sequins in. 2.Cut a piece of black card stock to 15.5 x 15.5cm, mat and layer with the red polka backing paper cut to 15 x 15cm. 3.Trim a 7.5 x 13cm rectangle of black card, layer with the pink stripe backing paper cut to 7 x 12.5cm then adhere to the left hand side. 4.Cut the next piece of black card to 12.5 x 12.5cm and add rose backing paper cut to 12 x 12cm, fix to the card. 5.Finally trim a piece of black card to 10.5 x 10.5cm and mat and layer with a square of Eiffel tower paper cut to 10 x 10cm, stick in place. 6.Glue the die-cut shapes to the card, then add 3 accordion stickers in the bottom left hand corner, finish with a bow in the top left corner. We love the use of sequins for this craft tutorial, they add a touch of fun and sparkle to projects. 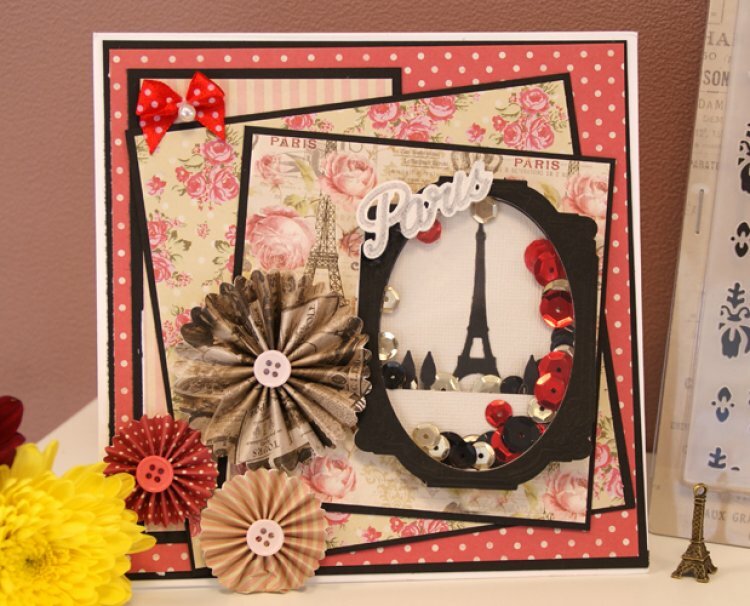 We can’t wait to see how you use them, don’t forget to upload & share your Sweet Paris projects to our project gallery. I recently made this Shadow Box Card using the Dovecraft Fairy Tales collection. Heres a Mothers Day Scrapbook Layout I made using the First Edition Mariposa papers. I made these pretty Arrow Fold Cards using the First Editon Forever Free papers.